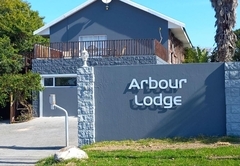 Arbour Lodge Guest House is one of the East London guest houses and provides accommodation in 8 guest rooms for tourists visiting the Sunshine Coast region. 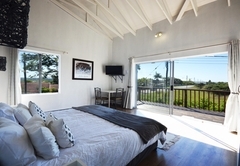 Nestled between two rivers and the warm Indian Ocean, Arbour Lodge Guest House offers a relaxing getaway and is a great option for couples or groups visiting this part of East London. 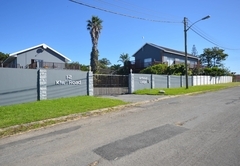 Guests can visit the nearby East London Nature Reserve. There are also many beaches, ideal for spending hours of fun in the sun. 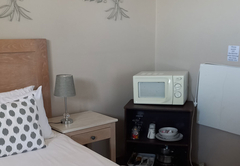 All units have a TV with DStv, a fan, heater and hairdryer. 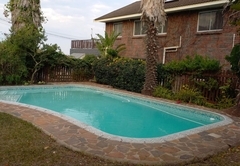 There is a swimming pool and braai facilities on site. Wi-Fi is available for guests use. 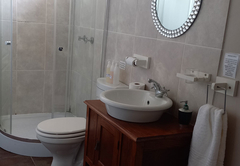 This ground floor room has three single beds, a full self catering kitchen and a shower en-suite. DStv is provided and there is free Wi-Fi. This well appointed unit has one bedroom with twin beds (or a King-size bed). 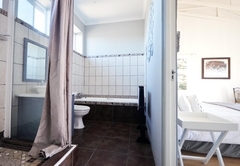 It also has two single beds, an en-suite bathroom and a fully equipped kitchen. 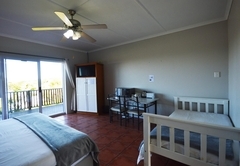 A ceiling fan, heater, TV and Weber braai are provided. 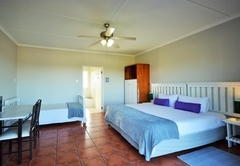 Room 4 is furnished with a King-size bed (or twin beds) and has en-suite bathroom. 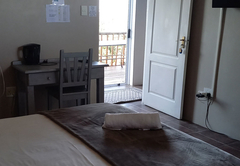 Amenities include DStv access, fans, heaters and Wi-Fi access. 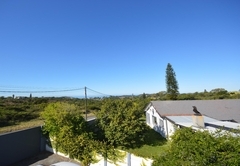 The unit has a well equipped kitchen and opens up onto a balcony with a sea view. This comfortably furnished unit has a King-size bed that can split into twin beds and has an additional day bed. 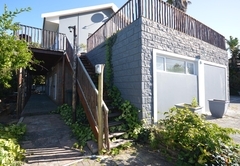 The front deck has a braai area and offers views of the garden and the ocean. This unit is furnished with a King-size bed which can be split into two single beds. It also has a day bed. 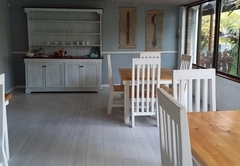 There is a self catering kitchen and a full bathroom. Room 7 is a beautiful room with its own private balcony. It has a full kitchen and a bathroom with a separate bath and shower. This room can also be a twin room. This private room is a comfortable and has a corner shower. Room 9 is a great room for a family of four. The room consists of a King-size bed that can be split into two single beds. It also has a day bed with a under bed. 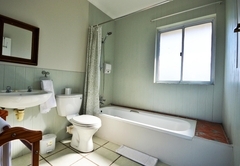 Ground floor room which has three single beds, with a full self catering kitchen and a shower en-suite. This well-appointed unit has one bedroom with two twin beds or a king-size bed. 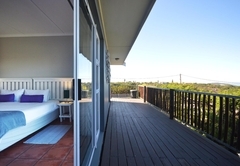 It also has two single beds, an en-suite bathroom and a fully equipped kitchen. 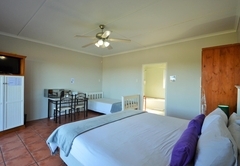 A ceiling fan, heater, Wi-Fi, Flat-screen TV, Weber braai facilities. Room 4 is a king bedroom which can split into twin beds and en-suite bathroom. Amenities include TVs with DStv access, fans, heaters and Wi-Fi Internet access. 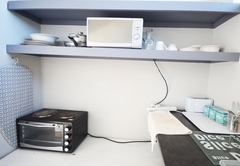 Each unit also has a well-equipped kitchen.Opens up onto a huge balcony with a sea view. 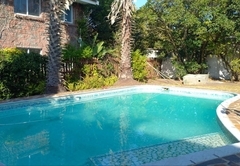 This comfortably furnished unit has a king bed that can split into a twin bed and it also has a day bed with a underbed and occupies the upper level of the main building. 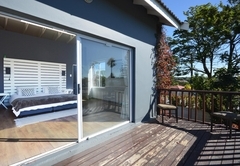 The front deck has a braai area and offers views of the garden and the ocean. 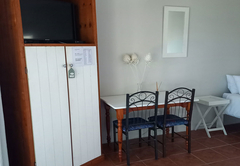 This unit consists of a king bed which can be split into two single beds.It has a day bed with a underbed, a full self catering kitchen and a full bathroom.Its a corner unit which makes it quite private. 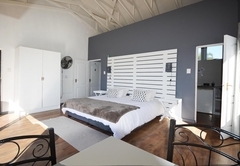 Room 7 is a beautiful room with its own private balcony and has a full self catering kitchen and full bathroom. (seperate bath and shower) This room can also be a twin room and the bed can slit into two. This room is a comforble room with a corner shower and is very private. Room 9 is a room that is great for a family. The room can accommodate 4 people. The room consists of a King bed can be split into two single beds. It also has a day bed with a underbed. Response timeArbour Lodge Guest House typically responds to requests in 5-10 minutes.